My dog prefers the cat’s food and always eats it instead of his own dog food. I’ve tried several different kinds of dog food, but he ignores it and eats the cat food every time. Is it okay to just feed him cat food, since he obviously prefers it? “As parents we encourage our children to try new foods. In this case, encouraging your dog to eat cat food is problematic. Your dog probably prefers the cat’s food because it smells stronger. That does not mean it is good for him or her. Cats are not just small dogs; they have different nutritional requirements than dogs. Cats are meat eaters and their diets are designed that way. Dogs, on the other hand, are omnivores. They are meant to eat meat and plants. Just as there is no one perfect diet for people, there is no one perfect diet for dogs or cats. But we do know the average nutritional requirements for dogs and a feline diet does not match those requirements. So, is your cat’s diet harmful to your dog? Well, is a glass of wine, piece of cake, or bowel of popcorn with butter and salt bad for us? Not necessarily, it all depends on the proportions. Too much of anything is bad for us. Using cat food as a training aid in small quantities might be okay, but all cat food is unhealthy for your dog. If you check the nutritional labels on dog and cat foods, you will notice certain trends. Cat food is higher in protein than dog food. 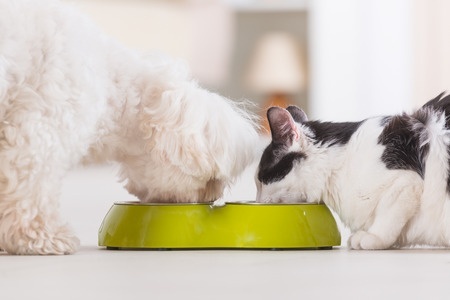 As an example, comparing the same brand of salmon based canned cat and dog foods, the cat food has a protein content of 8.2% and the dog food was 5.9%. The higher protein in cat food can be a particular problem if you dog has a medical issue needing a restricted protein diet. A prescription canned kidney diet for dogs may have protein as low as 4%. The higher protein in the cat diet is hard on the kidneys and may make the progression of disease worse. Sodium was 0.12% in the cat diet and 0.05% in the kidney diet for the dog. Again, the higher sodium content is harmful to the dog needing low sodium. 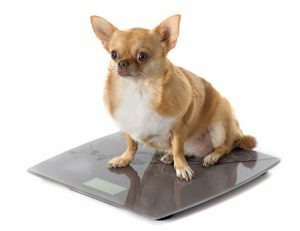 Feeding your dog cat food can lead to obesity and other health problems. The cat food was 7% fat and the dog food 5% fat. The cat food is a richer food which can cause GI problems for your dog. Most commonly this can be seen as diarrhea or pancreatitis. Additionally, the high levels of fat will tend to encourage obesity in your dog. Obesity is the number one medical problem we deal with in veterinary medicine. As in the human field, obesity complicates the treatment of most medical conditions we see. It is an especially difficult issue in patients with arthritis. By the way, the reverse is also true. A dog food diet is even worse for cats. Cats must ingest several required amino acids that their body cannot make themselves. These are not added to dog foods. Therefore, a cat eating only dog food will develop specific amino acid deficiencies which can be life threatening. If you enjoyed this article, you can read more of Dr. Winkler’s articles and learn more about him on our Contributors page.